Some social networking platforms are beginning to buy into data portability. Whereas any step toward opening up the closed data-silo islands is a positive step, the real question is what does data portability actually mean? Does this really solve the most important issue that users face when spelunking the depths of the social networking space? This is the fundamental defect with the notion of data portability on the closed Web. The duplication of a user’s data across multiple networks. While it’s great that a user has the flexibility, the freedom, even the right to take their data with them, in effect they are not taking anything with them. Users are not actually porting anything from one site to another. Porting implies the moving of an entity from one location to another, the transferring of data from one machine to another. In reality, data portability is about giving users the freedom and ability to grab a copy of their current dataset and paste it into yet another data silo. They are not actually moving their data as much as copying it from one silo to another. So, their data is now duplicated across multiple locations. The data silo (the social network) from which the data was copied (“moved”), does not delete the content—often even after a user requests the deletion of their account. Why? Because a member’s data, the content, is one of the most important business assets the social network owns. It is their key competitive advantage. This is the fundamental defect with the notion of data portability on the closed Web. The duplication of a user’s data across multiple networks makes it even harder for a given user to control their identity, privacy, and Web presence. What most people call a Web identity is simply an identifier. The true representation of an individual on the Web is what I describe as the set of all their identity graphs. I don’t want my personal data exported, copied, replicated throughout the Web. I am for data redundancy where it’s efficient and necessary, but exporting a copy of my dataset (or subset) from one social graph to another does not make sense. You are duplicating your effort. You are splitting up–or more accurately duplicating part of–your identity graph into little pieces and then strewing them into different locations, placing them in multiple, closed data silos. Don’t get me wrong. I am for true data portability. I’m just not in favor of the way it is currently implemented by the few participating social networks. What I am proposing is a step beyond data portability that is even more user centric, that could make the Internet a truly open space, that would help usher in the Social Web. 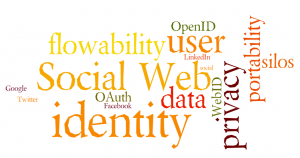 What is Identity on the Web? Before introducing my concept, it’s important to understand a key difference between my views of Web identity and the mainstream definition. The commonly-accepted definition of a Web identity is a digital representation of a user. It is one of many possible personae that an individual may have on the same social network or among all the networks in which a given person participates. But I believe this definition discounts the individual in the equation. In my article, Thinking Outside the Privacy Box, I discuss my philosophical views about identity on the Web. In short, what most people call a Web identity is simply an identifier. The true representation of an individual on the Web is what I describe as the set of all their identity graphs. In our service-centric Web-2.0 world of social networks where each new service is in effect a closed data silo, data portability is an important issue. What I’m suggesting is that the next focus of the Social Web should be to obviate the need for data portability. 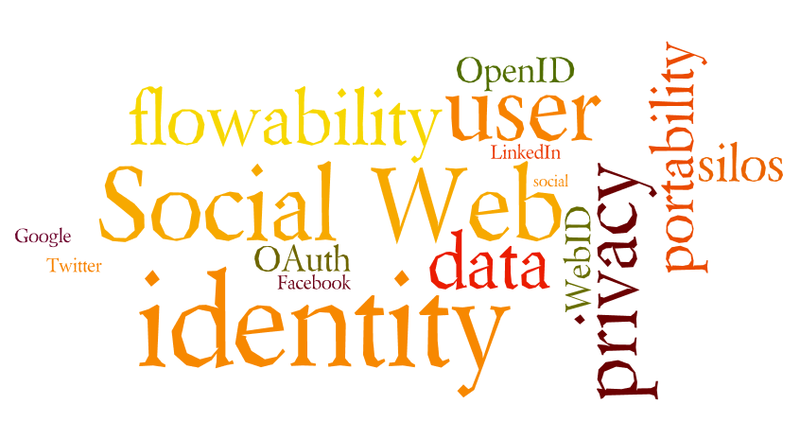 Instead of data portability, the Social Web needs to champion the concept of Identity Flowability. Identity Flowablility is the easy movement of and control over a given identity graph by a given user. Identity Flowablility enables a user to store any part of their identity graph in the places that they choose and then allow other sites to reference that data from those places—not copy the data from those places. Data would be semantically marked up to facilitate their auto discoverability for sharing between other sites. Access rights could easily be assigned. WebIDs could become the cornerstone in the user-centric Social Web. Thus the concept of Identity Flowablility is to provide each user with an easier, more efficient, and effective mechanism with which to control their entire IdentitySpace. It creates a user-centric container through which data content and privacy rights could be better managed and controlled. How would this concept change the Social Web? Instead of the quantity of users a site has being its most valuable, monetizable asset, the true value proposition of each Web 3.0-enabled company would be the quality and uniqueness of their service. No longer would a large membership base necessarily equal a big asset as smaller, more nimble niche-market players could compete by offering superior services. There is a very promising identification protocol that goes a long way toward creating the foundation of a flowable identity. It’s called WebID—in particular, a FOAF+SSL WebID. If you are interested in identity flowability, I encouraged you to learn more about WebIDs and how they could become the cornerstone in the user-centric Social Web. For an interesting, possible alternative to today’s closed-siloed Web, visit the Consortium for Local Ownership and Use of Data. Their task is challenging but in tune with my sentiment expressed above. Excellent thinking and good article. This is the first article I’ve read since we launched CLOUD, Inc. in March 2009 that “gets it.” CLOUD is the Consortium for Local Ownership and Use of Data, and we’re drafting a language for people on the Internet and not just web pages. CTML will be to privacy, security and data, what HTML has been to the web. We see the issue as one of ME 1.0, rather than Web 2.0, 3.0, etc. Regardless of what it is called, we fundamentally agree that simply making it easier to replicate data from one silo to another is pointless (with exceptions as you note). Check out what we’ve been up to at http://www.cloudinc.org. Thanks for the comment. CLOUD looks promising. Yes, you are correct, Henry. I should have wrapped up my article by extolling the virtues of WebID! It does, after all, solve the primary problem I’ve outlined above. I have added an addendum to the ending. WebID is about flowing identity, controlling identity. The idea of identity flowability is where I believe the focus should be shifted. It is a concept that might be easier to communicate to the masses, easier to explain the benefits of, and then tie in the technical aspects of WebID—which goes a long way toward addressing this issue. While I like the concept in theory, there’s a lot of issues to overcome. Let’s assume that Facebook & similar networks will be able to work with a common protocol to define the social graph. Take FOAF. Now you point facebook to your foaf file on slowhoster.com. If slowhoster.com is down half the time, what should facebook do meanwhile? How about the user? How will the user understand what’s going on? Then it takes time to really analyze the file and do the backend work to tie it all together. The foaf file will have to be copied and cached locally or else facebook will turn into waitbook. Then you need to make things more complicated by defining how often facebook needs to recrawl your graph. The HTTP spec can handle all this, but there has to be an interface to explain this in a user friendly way to the end user. Easier said than done. Solve all that and now everyone has to co-operate. It’s a tall order. But hopefully we’ll get there. Joe, this is all true. But I believe as more niche networks come along to fill the void that Facebook’s one-size-fits-all approach creates with users, more focus will be given to the issue of how data islands and even open, decentralized networks can more efficiently share data with one another. Of course, this is predicated upon the idea that users will actually care about regaining control over the management of their identity and privacy. If the vast majority of users remain clueless about such issues–or simply remain apathetic–then few mainstream social networks will have the incentive to evolve their platforms. The only outside chance of affecting change then will be for the wide adoption and use of well-designed, open source Social-Web platforms that have the foresight to address these types of concerns by coding solutions into the foundations of their cores.